One quick look at this bird’s bald head and you understand how it got “vulture” in its name. Take a closer look, and you see a spruced-up bird with a neck festooned with long, black-and-white feathers that show a touch of bright blue when ruffled. 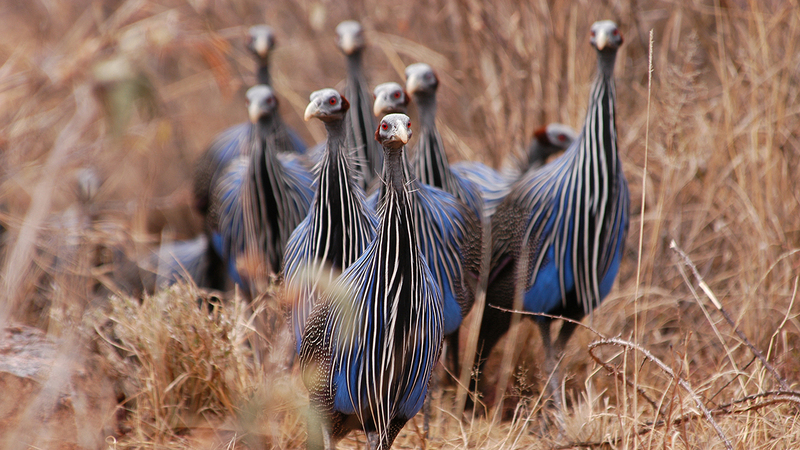 Why are these birds called vulturine guineafowls? They hunch their wings like vultures. Their bald heads resemble those of vultures. Vulturine guineafowl eat insects, seeds, and fruits rather than meat, but they have bald heads similar to those of vultures. ​Vulturine guineafowl are social birds that live in flocks of 20 to 30 individuals. Males and females have similar plummage, but the female is slightly smaller in size. 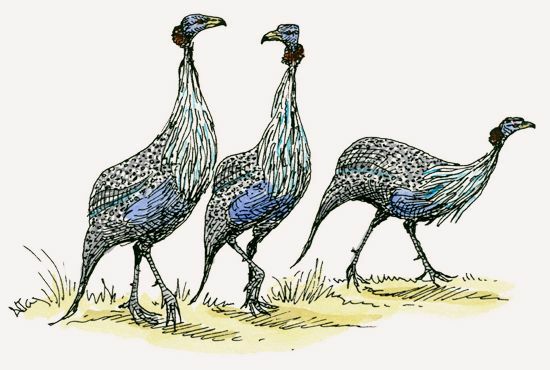 The call of the vulturine guineafowl is a high-pitched, sing-song wi-yi-why-yi-why-yi-wii. 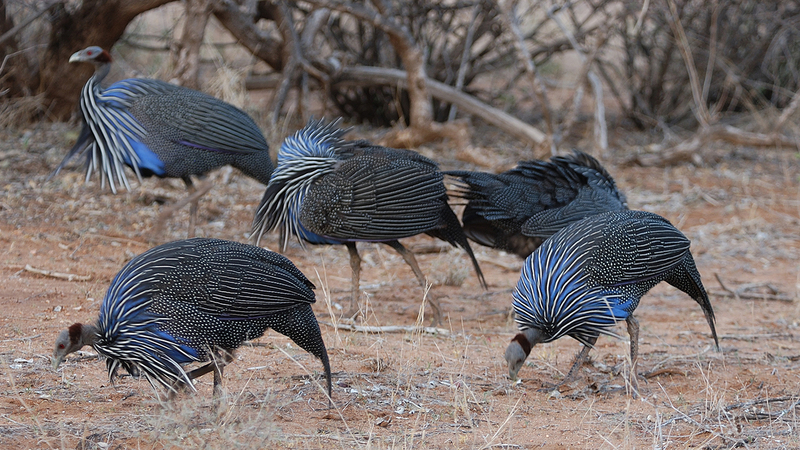 Vulturine guineafowls spend the day scratching the ground in search of food. At night they roost in trees. They are more likely to run away than fly when confronted, but they are strong fliers when they take to the air. ​The International Union for Conservation of Nature (IUCN) lists the vulturine guineafowl as lower risk because its population appears to be stable throughout its range. 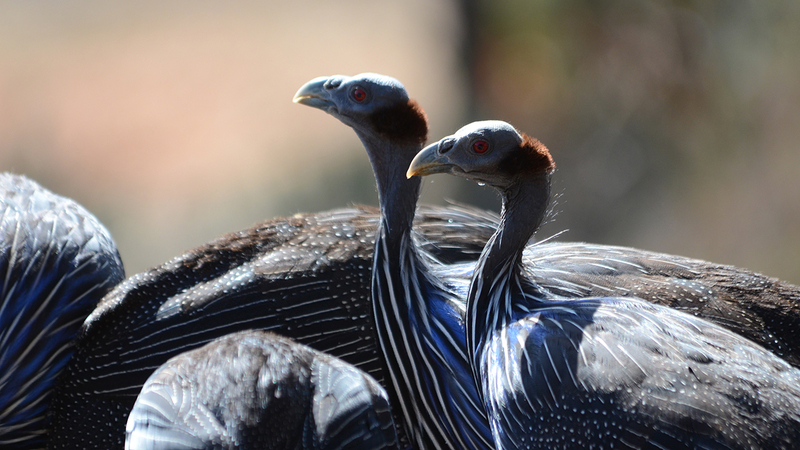 Vulturine guineafowls eat insects, seeds, fallen fruit, and tubers. They are quick enough to nab a small snake or rodent and can go for long periods without water. As the rainy season starts, so does this bird’s breeding season. Females lay as many as a dozen eggs in scrapes lined with grass or under low shrubs. Chicks incubate for 28 days and fly after about 10 weeks. 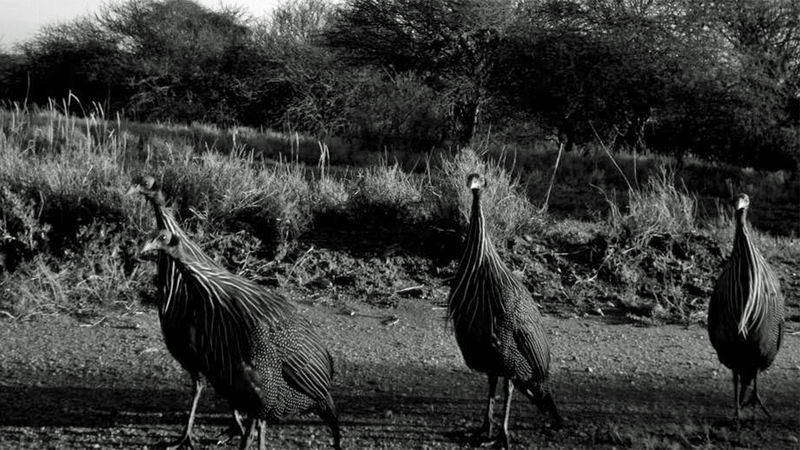 ​The main enemies of vulturine guineafowls are raptors, but monkeys will steal the eggs and chicks. 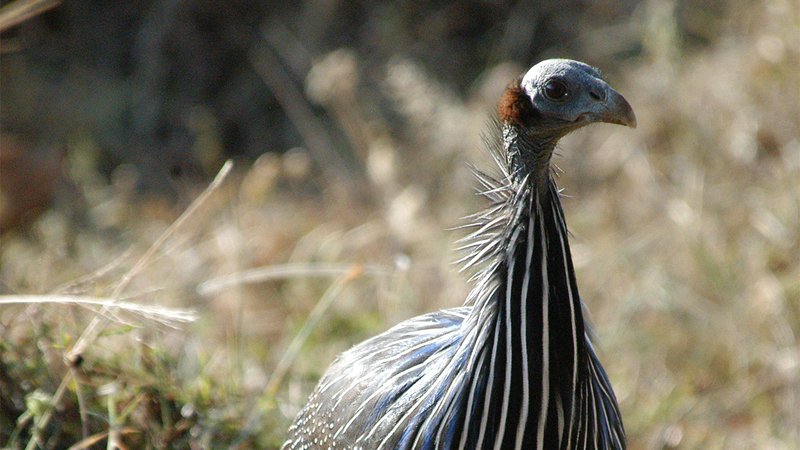 The vulturine guineafowl inhabits much of Kenya except for a strip along the western border. The vulturine guineafowl is common in acacia scrubland from southern Ethiopia and Somalia to Kenya and Tanzania. They live in the dry bush and savanna from sea level to 3,940 feet (1,200 m). When a vulturine guineafowl is disturbed, it walks or runs away swiftly. As a last resort, it will make an escape flight of 150 to 350 feet (46 to 107 m).